Listening to Leeza Mangaldas ’11 recount her experiences as a College student, it is easy to forget that she is just beginning her second year. Mangaldas spent her second semester planning a series of workshops she called “Living Peace,” which featured representatives of different religious traditions, including Buddhism, Christianity, Hinduism, Islam and Judaism, who spoke and demonstrated ways to achieve inner peace. Throughout the eight interactive sessions, participants had the opportunity to practice various strategies for finding a peaceful state, such as meditation and chanting. 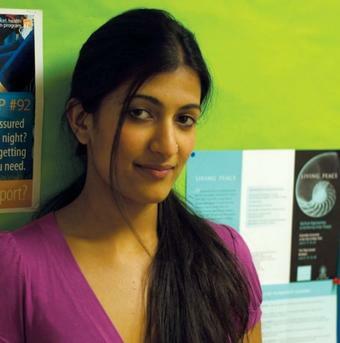 Leeza Mangaldas ’11 designed the brochure for Living Peace, as well as the program itself. Photo: Dana VlcekPoised and disciplined, Mangaldas developed the concept for Living Peace while helping Nicholas Vreeland, director of the Tibet Center in Brooklyn and a family friend, plan events for the organization. The Living Peace workshops were held in John Jay Lounge and the Tibet Center throughout June. Mangaldas, a Global Scholar from Goa, India, shared her idea with Lavinia Lorch, senior assistant dean of student affairs and director of the Undergraduate Scholars Program, who was impressed with Mangaldas from their first encounter. “Leeza trusts her instinct and her instinct, as far as I can tell, is always dead on. She inspired from the beginning a sense of security. What I saw was what I was getting,” says Lorch, who put Mangaldas in touch with the Center for Technology Innovation and Community Engagement (CTICE) at SEAS, where Mangaldas planned Living Peace and worked during the summer. While carrying a full course load, including her second semester of Lit Hum, Mangaldas diligently participated in every aspect of the project, from contacting potential speakers to designing the artwork for the brochure. The events were well-attended by members of the Morningside Heights community, averaging about 50 participants per workshop. “Leeza managed the project like a professional … the project has been a major success in terms of community participation, receptivity and community building,” notes Jack McGourty, associate dean of SEAS and executive director of CTICE. With Mangaldas’ help, CTICE has plans to host Living Peace events throughout the current academic year leading up to another series of workshops next June. “We will do this every year. This will be Leeza’s legacy,” says McGourty. Though she is very interested in the ways in which religion influences society and politics, Mangaldas does not consider herself a devout person. “I suppose that my family is, at some level, Hindu. My upbringing was very secular. No one was against religion, but they didn’t impose anything upon us,” explains Mangaldas, who has an older brother and a younger half-sister. Articulate and curious, Mangaldas has nurtured her growing fascination with religion through her coursework. After reading The Stillborn God: Religion, Politics, and the Modern West by humanities and religion professor Mark Lilla at the advice of a friend, she took his 4000-level course on conversion narratives during the spring semester and is considering a major in religion. Through the University’s Tutoring and Translating Agency, Mangaldas tutors high school students in math, English, science and Spanish, which she has studied for five years. In her spare time, she enjoys exploring New York City’s rich visual arts culture, from the Metropolitan Museum of Art to the galleries in Chelsea. Her interest in visual arts is no surprise; her father is an architect and her mother runs a design studio. “I’ve never been under any pressure to do what they’re doing, but having two artistically inclined parents rubs off on you,” says Mangaldas, who paints portraits and is considering a concentration in visual arts. Mangaldas says attending a boarding high school in India made it easier to move thousands of miles away from her family and her homeland to attend college in New York City. “Once you leave home and you’re living eight months of the year in another place, you grow up a little bit,” notes Mangaldas, who holds an International Baccalaureate Diploma. Though she had never visited the United States, Mangaldas chose the College precisely for the opportunity to live in Big Apple. With three undergraduate years ahead of her, Mangaldas is undecided about what academic trajectory she will pursue. And that is just fine with her. “Right now, I’m just enjoying the freedom I have as a student. Exploring is such a pleasure for me,” she says. Nathalie Alonso ’08, from Sunnyside, Queens, majored in American studies. She has seen every episode of I Love Lucy and is an avid New York Yankees fan.